The spring season is here, which makes everyone happy. Except the fish. 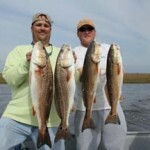 Inshore, redfish have finally arrived in numbers and are schooling. There have been some excellent catches in the past two weeks, with multiple limits (which are now two fish per angler per day). 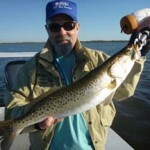 Trout are populating the flats and shallow structure, and the Spanish mackerel have arrived on the offshore bars. Some early cobia have been taken, along with a bumper crop of Florida snapper and black sea bass. Amberjack continue to provide some great action and great eating as well. Probably the biggest news is that the sheepshead have appeared on offshore structure for their annual spawn, and they have been really really hungry. I’ve had some fun trips now that the patterns have settled down and the seagrass is filling in. The redfish have been found, with the best numbers north of the river in the Dallus Creek and Fisherman’s Rest areas, with trout scattered in water from 3 to 5 feet in depth over sand holes in the grass. In spite of challenging weather near the end of the month, it’s been a great month at the Sea Hag. 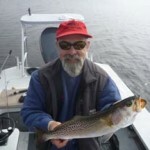 I’ve picked some pictures of some recent catches by our visitors. 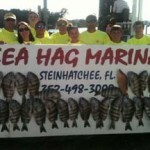 Lots of good things going on this month, especially for the offshore anglers. Red grouper season is open again, and as a special treat, gag grouper are open in state waters in only four counties in the Big Bend, including Taylor County. The total limit of any grouper is four, only two of which can be gags. 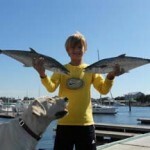 As the large schools of whitebait move into the area, kingfish will be appearing along with greater numbers of Spanish mackerel and bluefish, and cobia will once again be found on offshore structure and cruising the flats. If you’re fishing inshore, keep a sharp eye out for schools of redfish in shallow water. If you happen upon one fish, there may be more present. Try to land the fish quickly and make as little noise as possible. If you do find a school, they may move off so work the surrounding area carefully and quietly. If you’re stealthy, you can catch a number of fish out of one school without driving the school away. This time of year, you need to fish a variety of lures, including jigs with soft bodies or Gulp shrimp, suspending lures such as the Mirrolure Catch 2000 or Paul Brown Lures, crankbaits such as the Heddon Swim’n Image, or topwater lures like the Heddon Super Spook Junior or the Rapala Skitterwalk. You can also anchor and fish structure areas with live pinfish or shrimp. All these lures, as well as live shrimp and pinfish can be found at the Sea Hag’s Ship’s Store. Trout will be populating the flats as the pinfish population expands. Popping corks with jigs and Gulp tails or DOA shrimp fished around the sand holes in the flats will provide you great action. 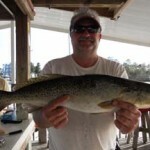 Live pinfish will also score well with grouper, fished over hard bottom in 40 feet of water and deeper. As of this writing, sheepshead are still being taken in good numbers on offshore structure such as the Steinhatchee Reef. Fish ½ ounce jigheads tipped with shrimp, and remember that these are spawning fish, so only keep those that you intend to eat, and try and release the larger females if possible.